Easy-to-administer ectoparasiticides that offer enduring protection increase adherence and provide better protection for pets. Most veterinarians throughout the United States recommend year-round ectoparasite prevention for pet dogs and cats due to the high prevalence of fleas and ticks and associated complications, including flea allergy dermatitis and vector-borne diseases. Flea and tick infestations also pose a zoonotic risk to pet owners. Treatment nonadherence client adherence. is a widespread issue in human and animal medicine. Studies examining a variety of drug classes show that adherence decreases with inconvenient routes of administration, frequent redosing, and longer treatment duration.5-7 Simpler, less frequent dosing is generally associated with significantly higher adherence rates. Bravecto (fluralaner, Merck Animal Health) is available as an oral flavored chew for dogs and a topical formulation for dogs and cats.8-10 Unlike other flea and tick preventives, Bravecto is marketed with a 12-week dosing interval. As a member of the isoxazoline class, fluralaner is only available through a prescription and is indicated for the treatment and prevention of infestations with the cat flea (Ctenocephalides felis), black-legged tick (Ixodes scapularis), American dog tick (Dermacentor variabilis), and brown dog tick (Rhipicephalus sanguineus). Fluralaner also provides 8 weeks of prevention against lone star tick (Amblyomma americanum) infestations. Pharmacokinetic studies indicate that fluralaner is absorbed rapidly following administration and has a wide safety margin in dogs weighing at least 4.4 lb and puppies aged 6 months or older. One survey compared veterinarian recommendations regarding flea and tick prevention with client perception and adherence. The second survey assessed client satisfaction, re-dosing adherence, and perceived drug efficacy after giving pet dogs the 12-week oral chew formulation of fluralaner. Both studies required that participants had purchased 2 or more fluralaner doses and were currently using the preventive for their dogs. Surveys were administered either in the veterinary clinic or via telephone following a hospital visit. In the first study, most participating pet owners (n = 559) were middle aged and female.11 Most (62%) owners accurately recalled their veterinarian’s recommendation for year-round flea and tick preventive use, while the remainder either underestimated the recommended months of coverage or did not recall their veterinarian’s recommendation. Most (73%) believed that 12-month flea and tick protection was necessary, with the exception of clients in the northeastern United States who believed an average of 9.5 months per year of flea and tick coverage was sufficient. Purchase records obtained from 6 veterinary hospitals showed that dog owners bought, on average, only 26 weeks (or 6 months) of flea and tick prevention per year, and only 13% of owners purchased 12 full months of coverage.11 These results support previous evidence of low client adherence with flea and tick prevention, despite the majority of veterinarians and dog owners believing that year-round protection is best. The second study, which evaluated client adherence and satisfaction rates after administering fluralaner, surveyed veterinary clients whose dogs ranged in age from 7 months to 16 years.12 Respondents indicated their dogs spent an average of 4.2 hours per day outdoors, suggesting a significant risk of flea and tick exposure. These studies support growing evidence that longer-acting drug formulations, which are becoming increasingly available in veterinary medicine, result in increased client adherence.5,13 In turn, increased adherence offers multiple benefits for the patient, client, and veterinarian. Clients are more likely to give medications that are easy to administer, and patients are less likely to experience gaps in coverage with longer-acting medications. Additionally, the use of a prescription flea and tick preventive guarantees that the patient receives a high-quality product backed by evidence-based support, thus ensuring the hospital’s best practices are met. Ultimately, adherence results in healthier patients, higher client satisfaction rates, and an improved veterinarian-client-patient relationship. 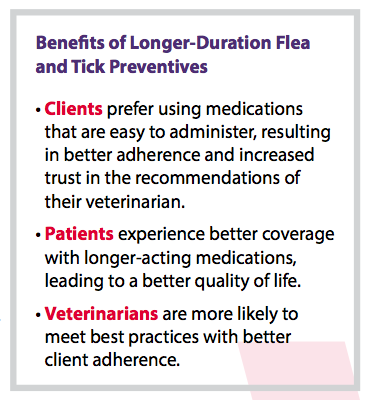 Evidence-based studies reflect growing veterinarian and client satisfaction with the use of longer-duration flea and tick preventive medications—ultimately providing superior protection and a higher quality of life for the patient. Transdermal Bravecto Market Assessment Study. Quantitative findings. Madison, NJ: Merck Animal Health; 2015. Sullivan S, Kreling D, Hazlet T. Noncompliance with medication regimens and subsequent hospitalizations: a literature analysis and cost of hospitalization estimate. J Res Pharmaceut Econ. 1990;2:19-33. doi: 10.1300/j063v02n02_03. Coles TB, Dryden MW. Insecticide/acaricide resistance in fleas and ticks infesting dogs and cats. Parasit Vectors. 2014;7:8. doi: 10.1186/1756-3305-7-8. Tamura G, Ohta K. Adherence to treatment by patients with asthma or COPD: comparison between inhaled drugs and transdermal patch. Respir Med. 2007;101:1895–1902. doi: 10.1016/j. rmed.2007.05.001. Saini SD, Schoenfeld P, Kaulback K, Dubinsky MC. Effect of medication dosing frequency on adherence in chronic diseases. Am J Manag Care. 2009;15(6):e22-23. Bravecto (fluralaner) flavored chews product information summary. Bravecto website. https://us.bravovets.com/pdfs/Bravecto-Chew-PI.pdf. Published 2014. Accessed January 10, 2018. Bravecto (fluralaner topical solution) for Cats product information summary. Bravecto website. https://us.bravovets.com/pdfs/Bravecto-Cat-PI-155373-R8-8.5x11.pdf. Revised September 2016. Accessed January 10, 2018. Bravecto (fluralaner topical solution) for Dogs product information summary. Bravecto website. https://us.bravovets.com/pdfs/Bravecto%20Dog%20PI_152451%20R11_8.5x11.pdf. Revised September 2016. Accessed January 10, 2018. Lavan RP, Tuncell A, Zhang D, Normile D, Armstrong R. Assessment of dog owner adherence to veterinarians’ flea and tick prevention recommendations in the United States using a cross-sectional survey. Parasit Vectors. 2017;10:284. doi: 10.1186/ s13071-017-2217-2. Lavan RP, Armstrong R, Normile D, Zhang D, Tuncell A. Results from a U.S. dog owner survey on the treatment satisfaction and preference for fluralaner against flea and tick infestations. J Vet Sci Technol. 2017;8:3. doi: 10.4262/2157-7579.1000439. Van VI, Nautrup BP, Gasper SM. Estimation of the clinical and economic consequences of non-compliance with antimicrobial treatment of canine skin infections. Prev Vet Med. 2011;99:201-210. doi: 10.1016/j. prevetmed.2011.01.006.